Danish Army Specific: This particular truck was used by the Danish Brigade in Germany after WW II, reportedly as post office-truck. The radio normally carried in the shelter was known as the SMH. Same set-up was mounted on Bedford MW trucks. The vehicle appears to have a cab roof. Whether this was a British or Danish modification is not clear. The type was replaced in the mid 1950´s, in some cases by the Bedford A2C. Historical: The Guy Ant was prototyped in 1935 to meet a War Department specification for a 15 cwt infantry truck. Around 90 percent of the components was used in earlier trucks like the Vixen and the Otter. A civilian version of the Ant, known as the Vixant were also produced. These were used for what was then known as "essential transport applications". Early production Ants had a flat bonnet, canvas doors and aero screens. The bonnet was changed to the v-shaped type shown above. This was presumably done to clear additional ancillaries. The Ant had an unusual gear change pattern, opposite to the normal type. In 1938 a four-wheel drive version (Quad-Ant) was launched, initially for use as a field artillery tractor. 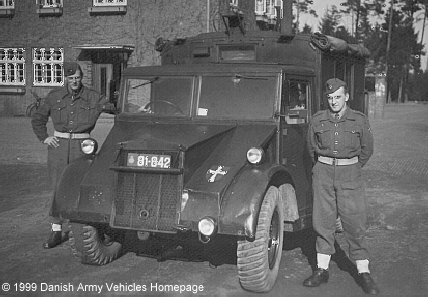 The first order for 150 vehicles was received in January 1936, shortly after successfully taking part in the Army trials in Llangollen in 1935. Some 8.250 trucks were produced until March 1942, mostly as GS trucks and some equipped for cable laying. Some batches received house-type van bodies for wireless (shown), light warning equipment, light machinery, recorder or equipped as compressor trucks. Water tanker and fire truck variants were produced for domestic Government use. As a part of an attempt to rationalise the post-war fleet on the British Army the Ant and Quad-Ant was declared obsolete and auctioned of or passed on to other countries. Length: 4.39 m (173 inches). Height: 2.20 m (87 inches). Weight: 3.314 kg (7.365 lb.). Engine: 4-cylinder Meadows 4ELA, 3.686 cm3 (143 cubic inches) displacement, liquid cooled, carburettor. Horsepower: 55 at 2.600 rpm. Fuel capacity: 91 liter (20 gallons).